The day which we were all waiting for is finally here. Pawan Kalyan’s big budget film, Sardaar Gabbar Singh has hit the screens with a lot of pre-release buzz today. Let’s see whether it lives up to its expectations or not. Gabbar Singh(Pawan Kalyan) is a happy go lucky cop who gets transferred to a ruthless town called Ratanpur. Upon his arrival, he finds out that the entire town is suffering from the evil deeds of Bhairav Singh(Sharad Kelkar). As time passes by, the princess of Ratanpur, Arshi(kajal) falls in love with Gabbar Singh. Twist in the tale arises when Gabbar Singh comes to know that he is actually sent to that town to solve the problems of Arshi and her royal family which is under the threat of Bhairav Singh. Rest of the story is as to how Gabbar Singh fights with the mighty Bhairav Singh and solves problems of both Arshi and the entire village. Kajal looks drop dead gorgeous as a princess. She has lost weight and looks superb in all her royal costumes. Sharad Kelkar makes a solid Tollywood debut. He is menacing as the bad guy and performs his role to the T. All his confrontational scenes with Pawan Kalyan have been executed well. First half of the film is quite good with some interesting fan moments. Brahmanandam is decent in his role and evokes some laughs. Interval bang and the comedy skit that comes during the second half has been written well. Mukesh Rishi does his supporting role naturally. Story of the film is ages old and has nothing much interesting to offer. The first half an hour during the second half goes for a toss as the proceedings deviate from the topic completely. Also, the presence of two back to back songs in the second half disturb the flow of the film big time. There are no major twists and turns as the film moves on a single thread till the end. The proceedings are quite predictable and the climax is also wrapped up in an unconvincing manner. After showcasing Sharad Kelkar’s character in such a powerful light during the first half, he is completely sidelined and becomes ineffective towards the end. Music by Devi Sri Prasad is decent as most of the songs suit the mood of the film well. 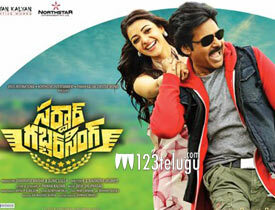 Screenplay by Pawan Kalyan lacks the necessary punch as most of the scenes in the second half go wayward. Dialogues are pretty good and those written for Pawan elevate his charisma. Production values are quite good and special mention should go to the art department for putting up the beautiful Ratanpur set and making it look quite realistic. Coming to the director Bobby, he has done just an average job with the film. He has dragged a simple point to unnecessary lengths and made the film look tedious at places. But credit should go to him for showcasing Pawan Kalyan in a way that fans will be hugely satisfied with.